This is an unheard of price for such a combo – please check online YT videos and other forums to see if this is a good machine for you! US and Canada only…but check it out, might pertain to other areas. $399 for the complete kit with R/C controller. Hubsan GPS drones – starting at about $60! 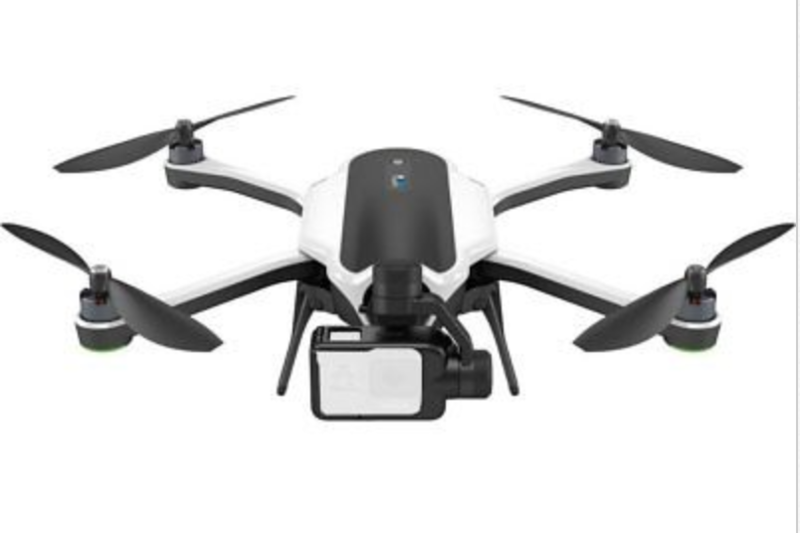 Completely Amazing – a GPS drone with a camera and app for less than $60…. 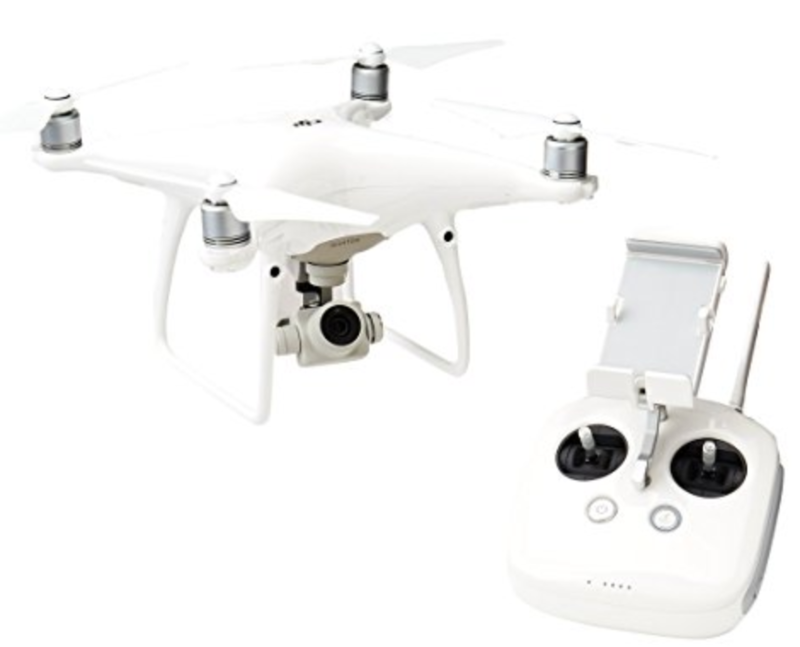 this one does have brushed motors, which don’t last as long as brushless…..
Refurbished (full warranty) DJI Products starting at about $100! The Osmo Mobile is just $109! – Everyone should get one at that price! Spark refurb for $279 – unheard of! 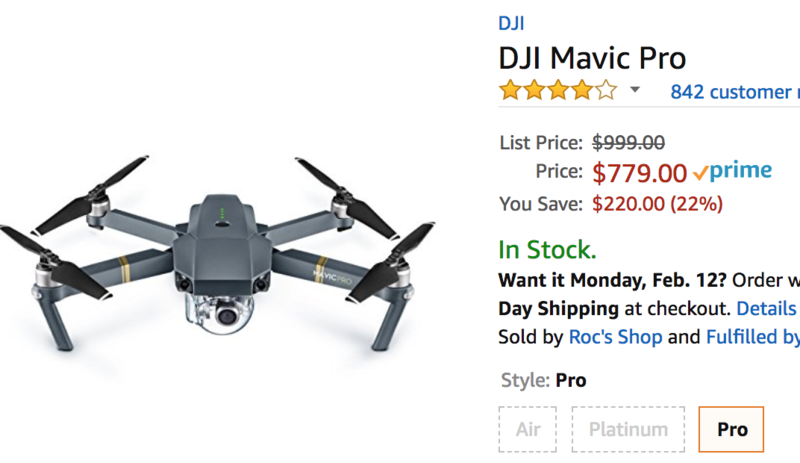 By far the best price ever – almost 1/3 of the original price – for this selfie 4K drone. 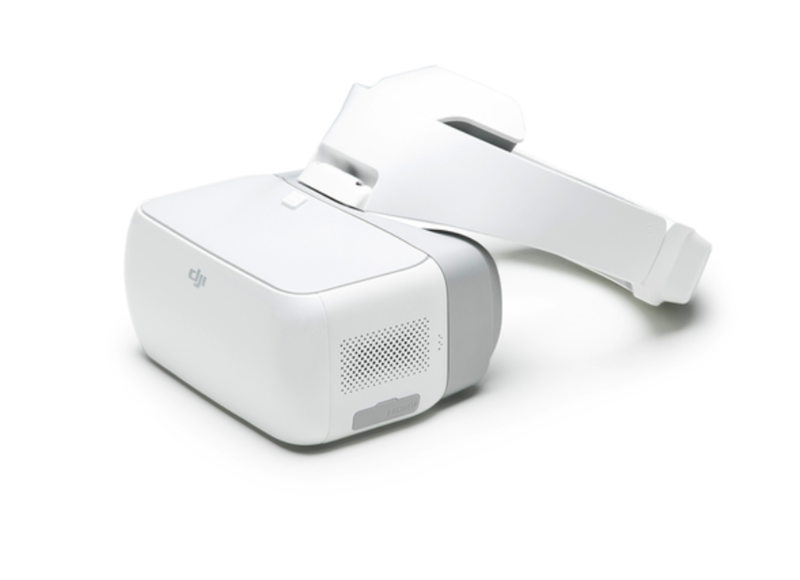 It will work with your mobile device only or with the included controller. 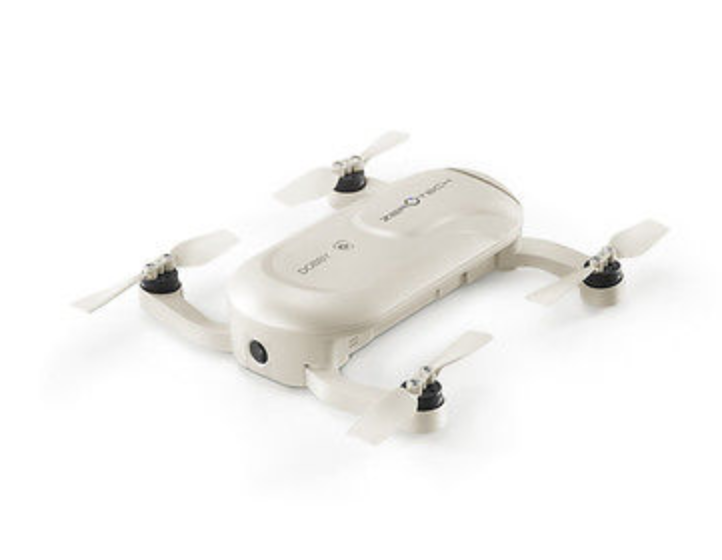 $149 (plus you should buy at least one extra battery) for a GPS drone! Note – lots of them available in stock at local Wal-Marts…their site should clearly show where it is available in stock. 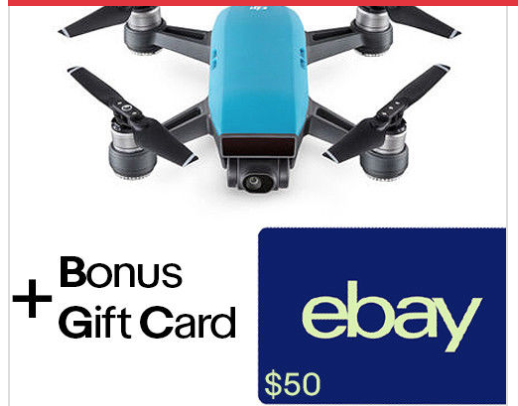 Wow, for less than $700 you can fly our #1 Recommendation in camera drones. 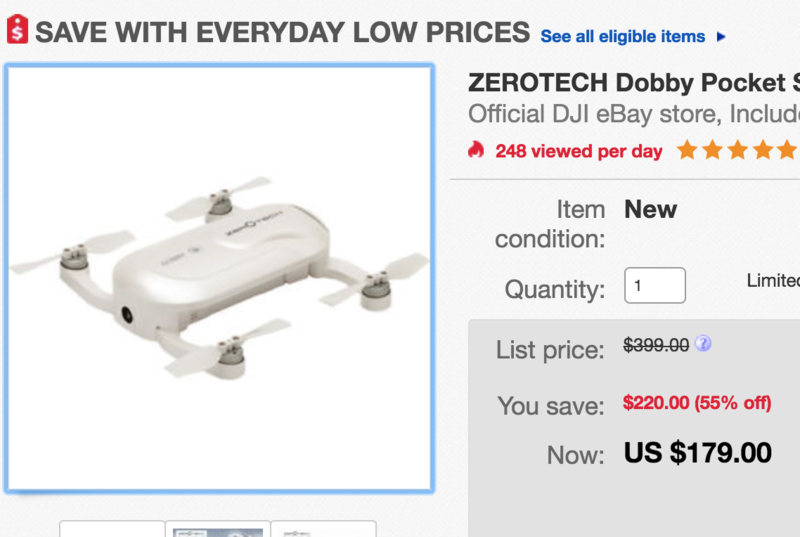 By far the best price we have seen on this beginners drone. Make sure you don’t try to fly it in too much wind…otherwise, it’s a great machine! Buy two and then you will have an extra battery and parts to repair your unit with! 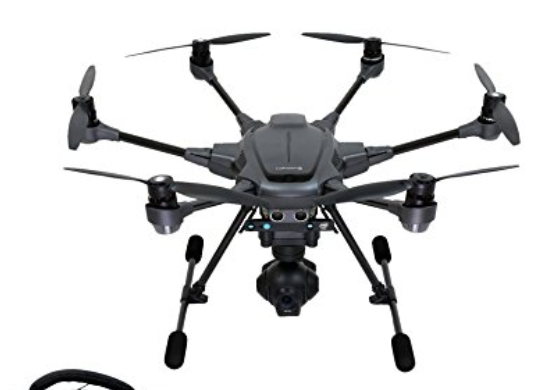 These are very popular drones for hacking, modding or just flying around. The brushless motors mean you won’t have to replace them as you do with brushed drones. 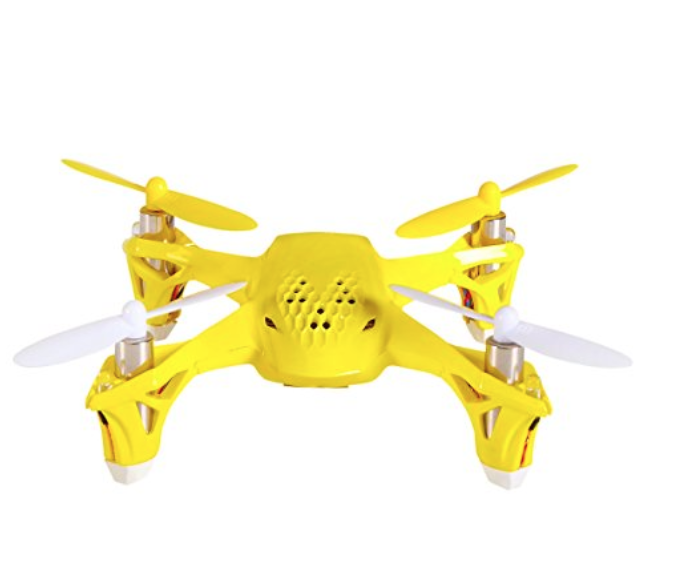 This is the lowest price we have seen for a quality brushless drone! 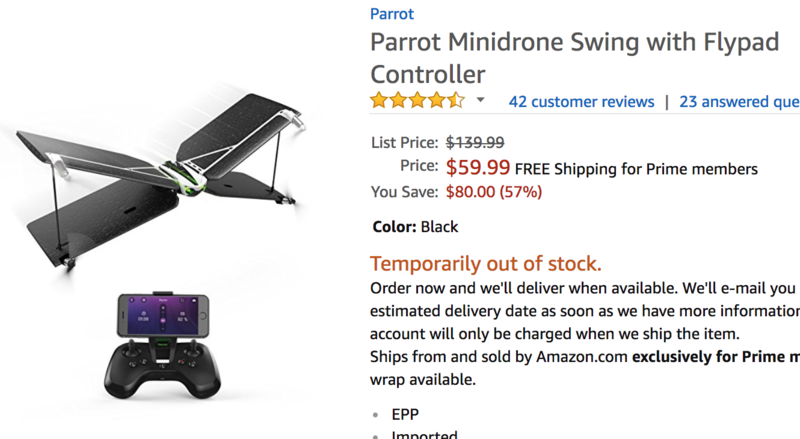 Parrot Swing with Controller – $29.99 eBay! This was $100 or more! 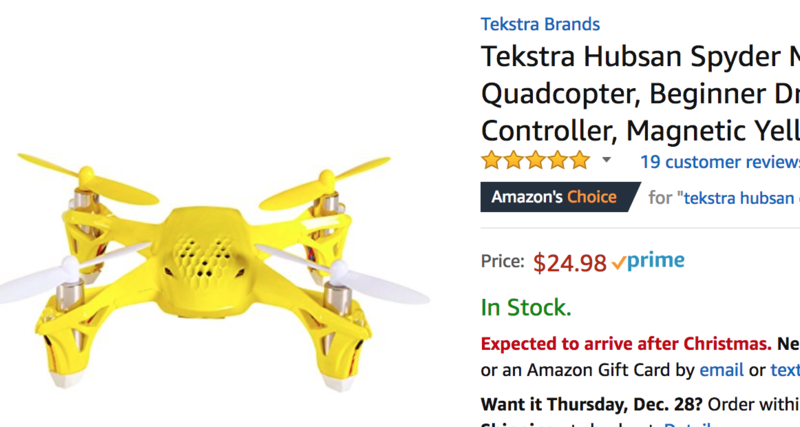 For that price, anyone interested in winged quadcopters (VTOL) should pick one up. 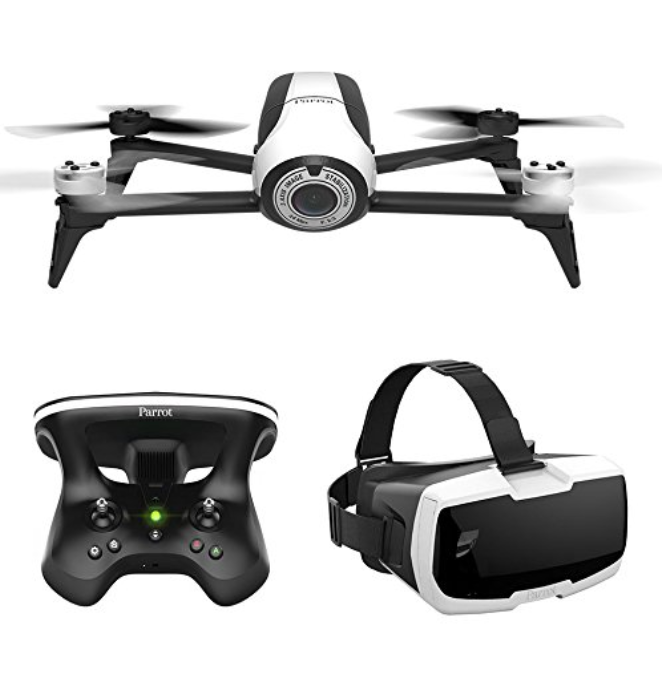 At an original price of $999, $779 represents a good value for one of our favorite drones. 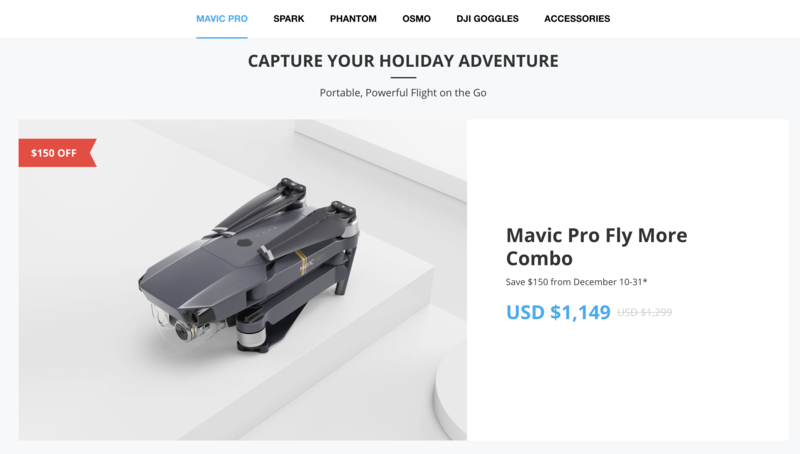 DJI Spark in certain colors – $369 – a little more ($378) in other colors. 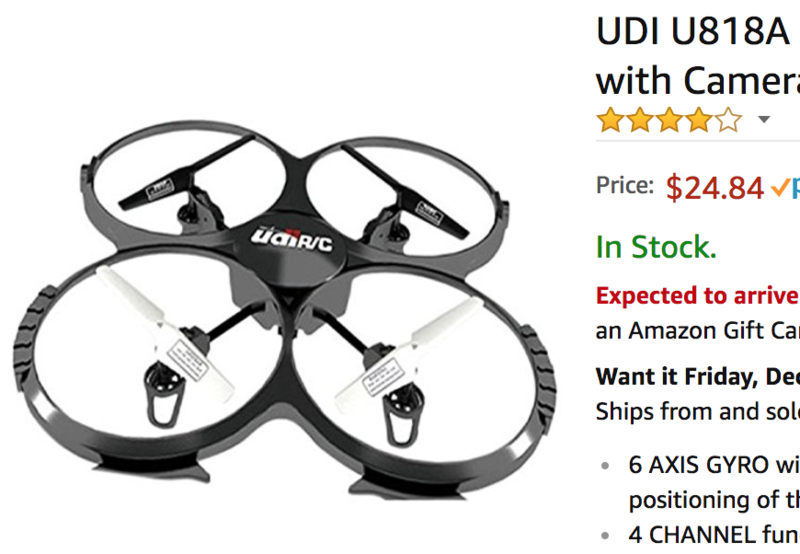 This is about the lowest price ever for the basic drone. 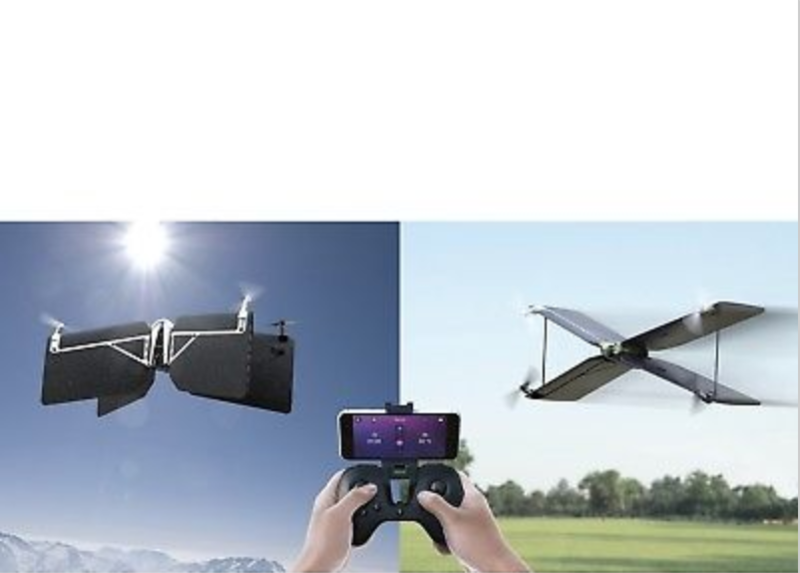 However, most Spark buyers are going to want the Remote (as opposed to using it just with an iphone)…..
or, buy one of the many packages which might include an extra battery, prop guards, etc. 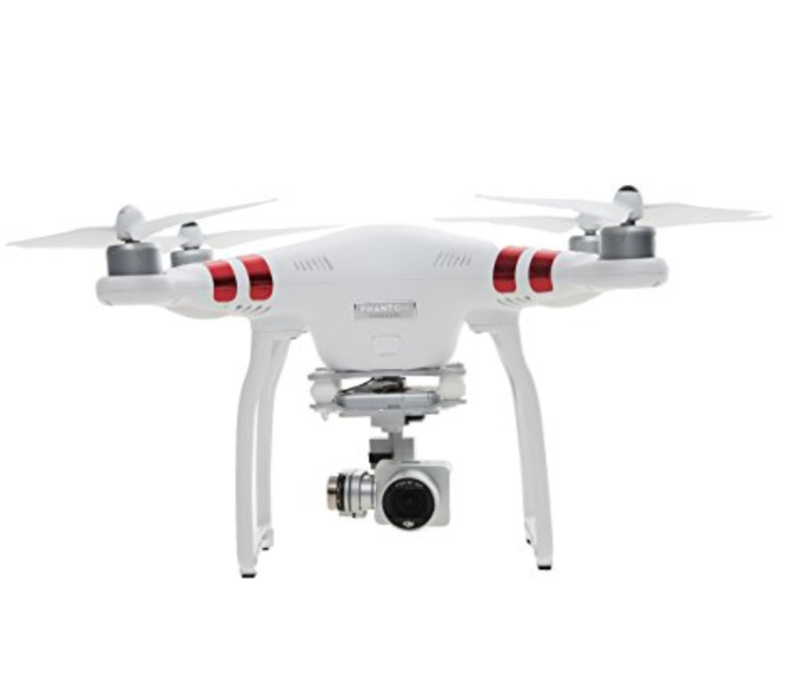 Quite a package for less than $400 – for those who want to get started in aerial photography! 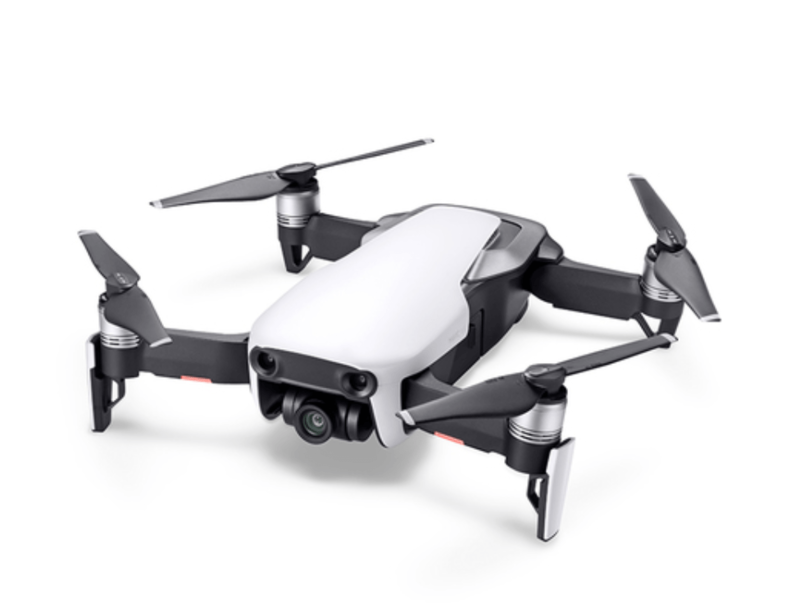 New DJI Mavic Air – $799. 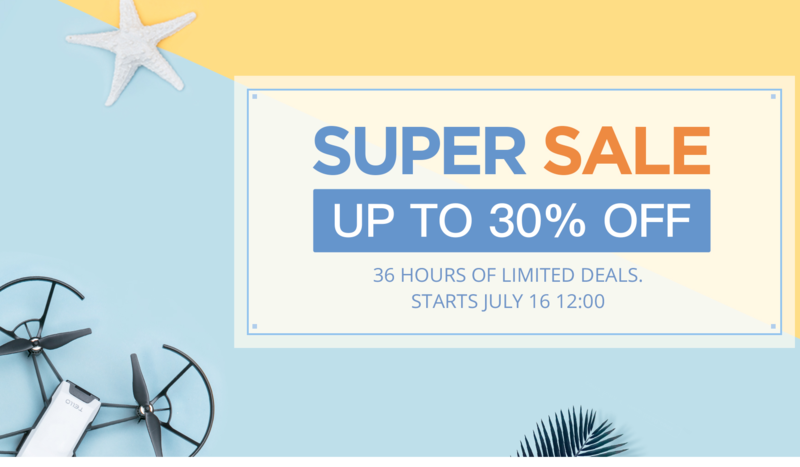 Lowest price we’ve seen – under $25 – on a great beginner copter. I have this one myself and it’s the only toy model I regularly fly. Make sure to get some extra batteries. Lowest price ever when batteries are figured in! Lowest price we’ve seen on the unit itself. 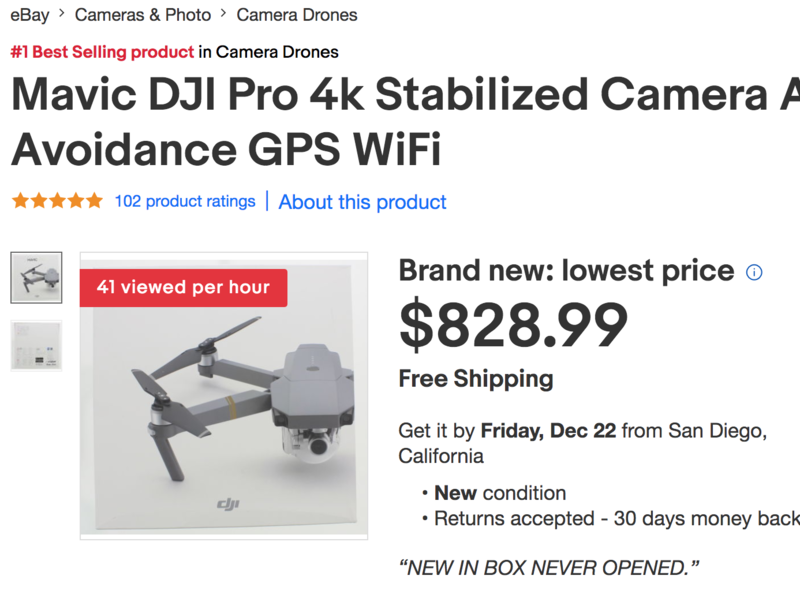 If this deal is real, it’s much better than the DJI sale where you get a free battery. This saves you over double that amount – just make sure it comes with the CS 5.5″monitor at this price! Temp out of stock, but at $150 off it’s probably worth waiting a couple days for! If you want to take nice still pictures from far away – and not lose your drone, this is quite a nice machine. They have been getting great reviews…lots of fun for the money. Drone in a ball – to really learn inside, etc. 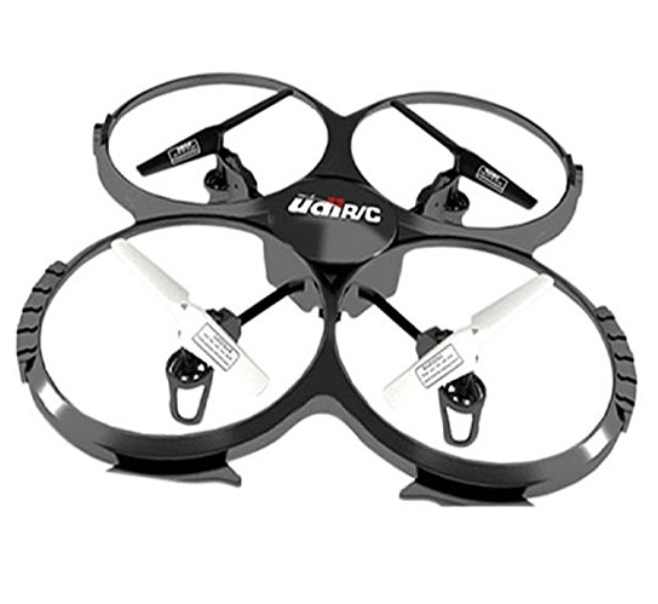 Full size popular starter toy quadcopter for the lowest price we’ve ever seen. 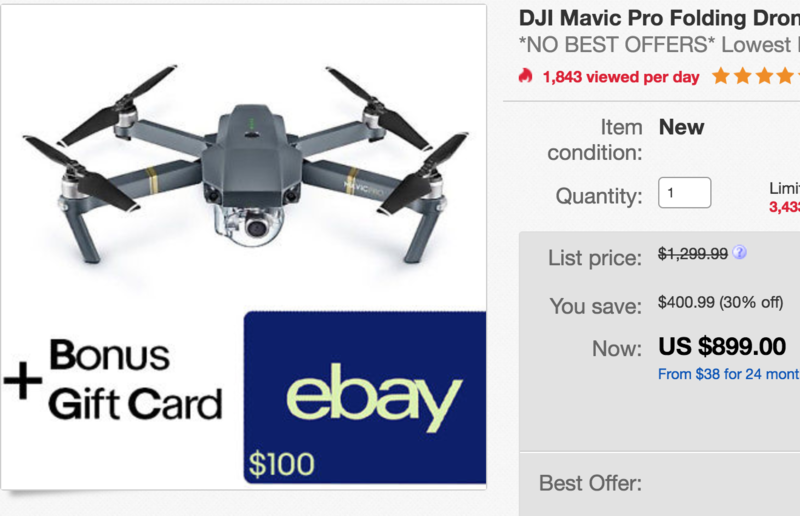 Deals on the other units in the 100’s of dollars off (free battery for Phantom 4, etc. 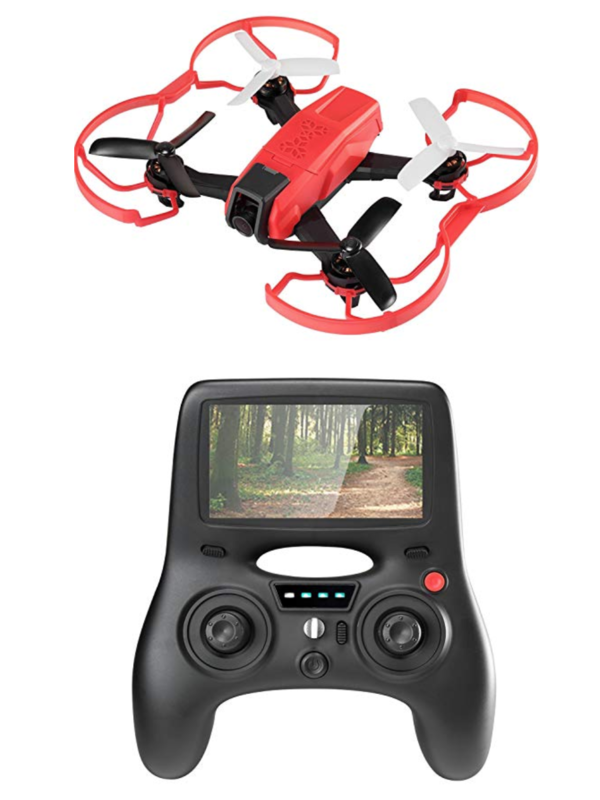 This is a cool toy drone – and Parrot includes the flypad (RC control) so you can have more range, etc. For the price, a no-brainer. Out of stock but we just ordered one for ourselves….so you can place orders. 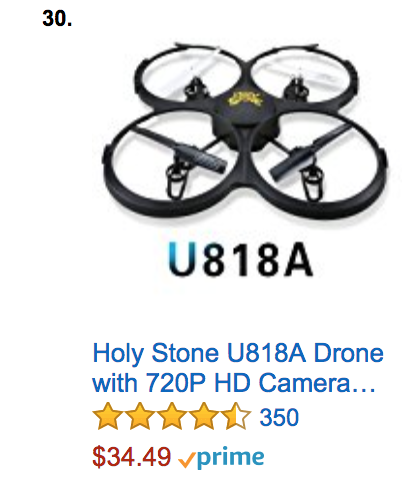 If you want an advanced drone for a "toy" price, this is the one to consider. For what you get it is nothing short of amazing. If you budget allows get the full kit with the R/C Control and extra batteries. No doubt one of the best quadcopters ever made – at a price less than 50% of original. 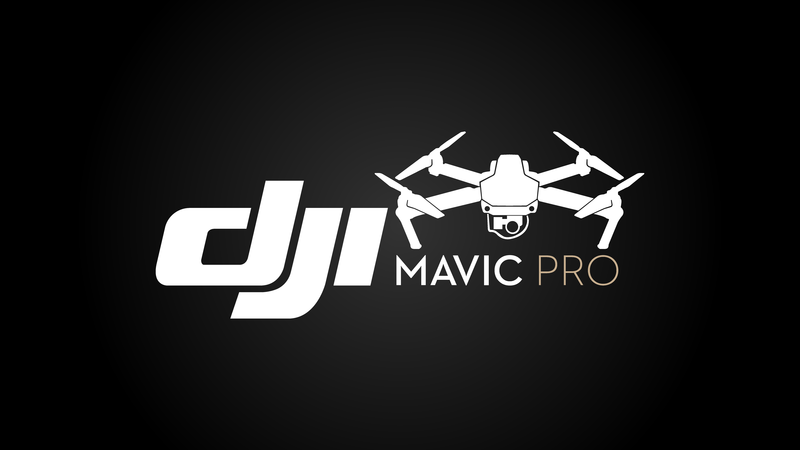 If you can handle buying refurb and want a budget Drone – yet capable of pro-level pics and video – this is calling your name! This makes it the lowest price for a NEW unit – effectively $799 if card is used. 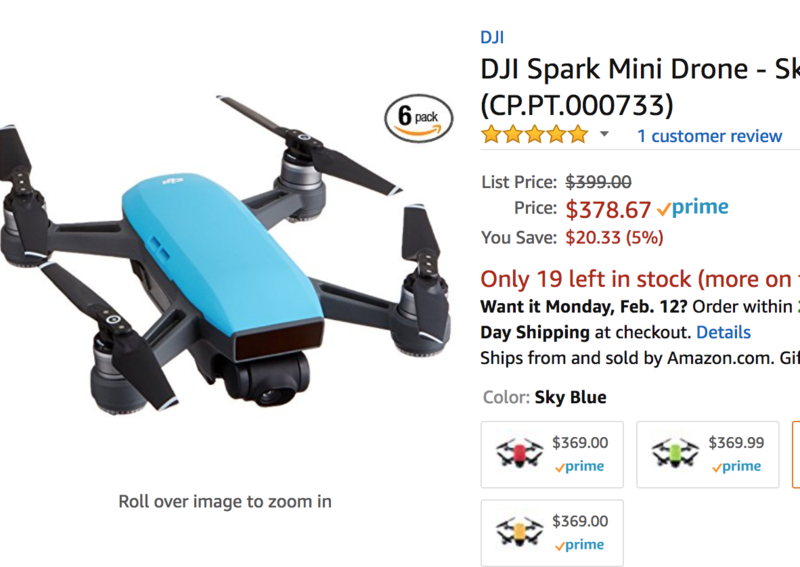 Definitely the lowest price ever – brings the Spark down to $350 – various colors available…. 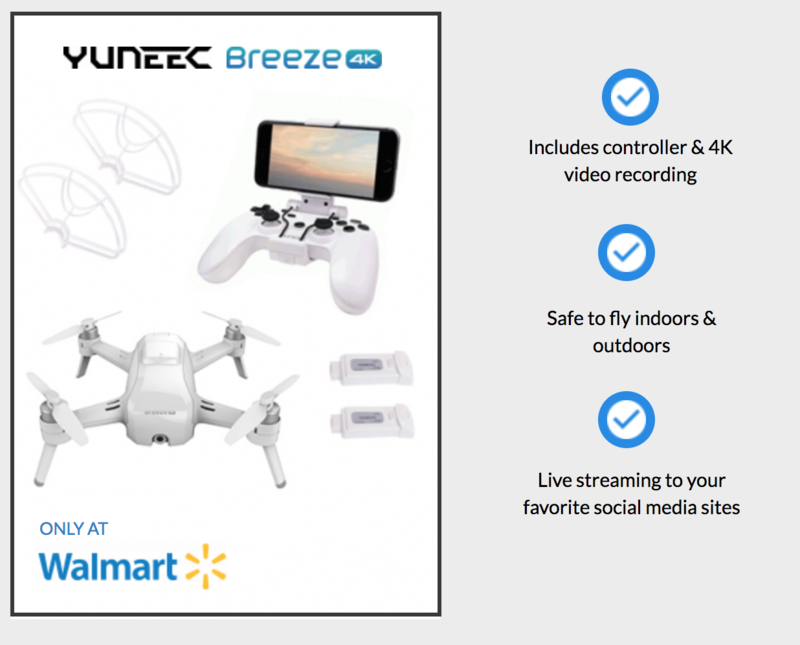 Yuneec Breeze $199 complete at WalMart! 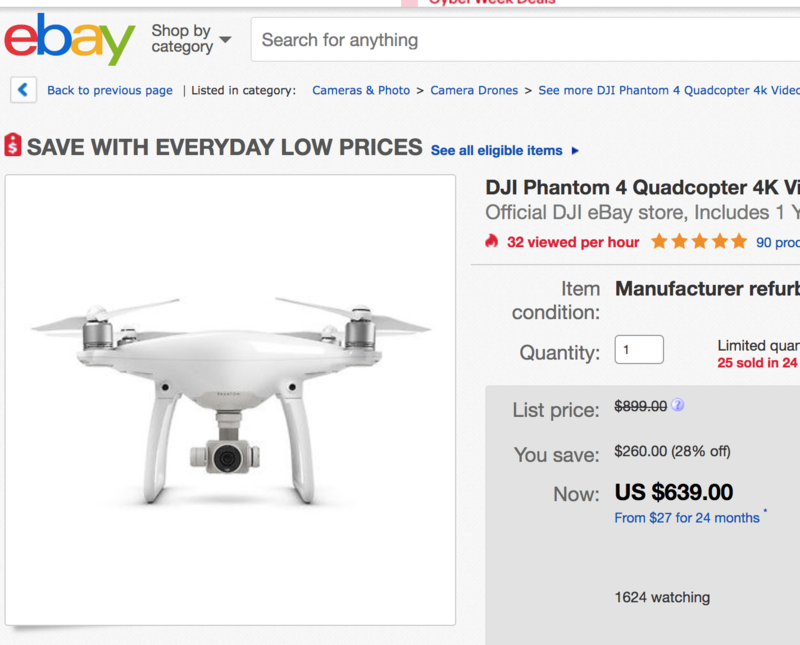 Best deal ever on this particular drone and accessories…by far. $225 dollars off, but you have to settle for the white one! This is the lowest we’ve seem the P4P for. 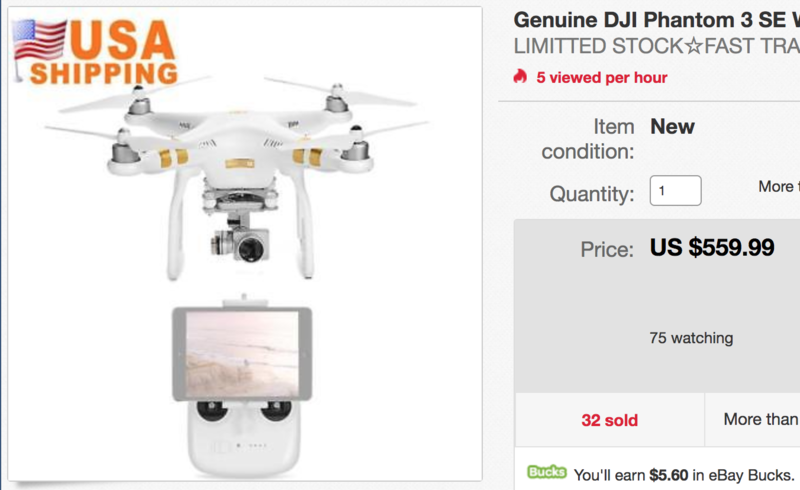 Although DJI is having a good sale, the eagle eyed shopped can find some units for a few bucks less. 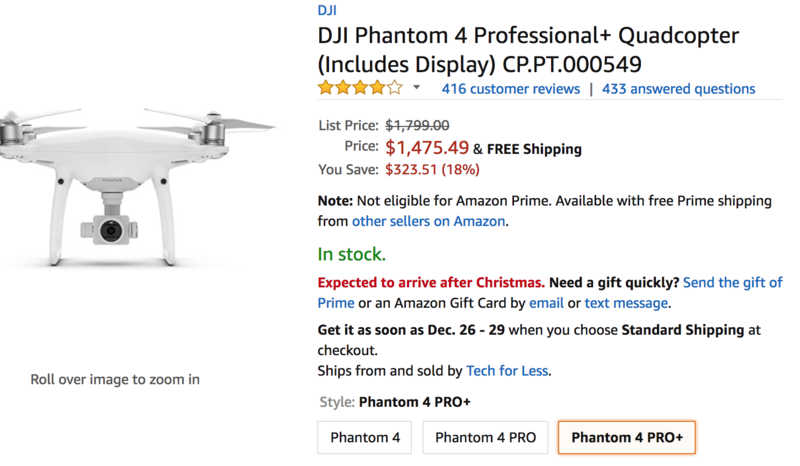 Be aware of fake "fly more" bundles where the vendor puts together his own package – get a real DJI package is possible. Close to the lowest price and includes Amazon service and shipping – if you have an Amazon CC you save another % or so. 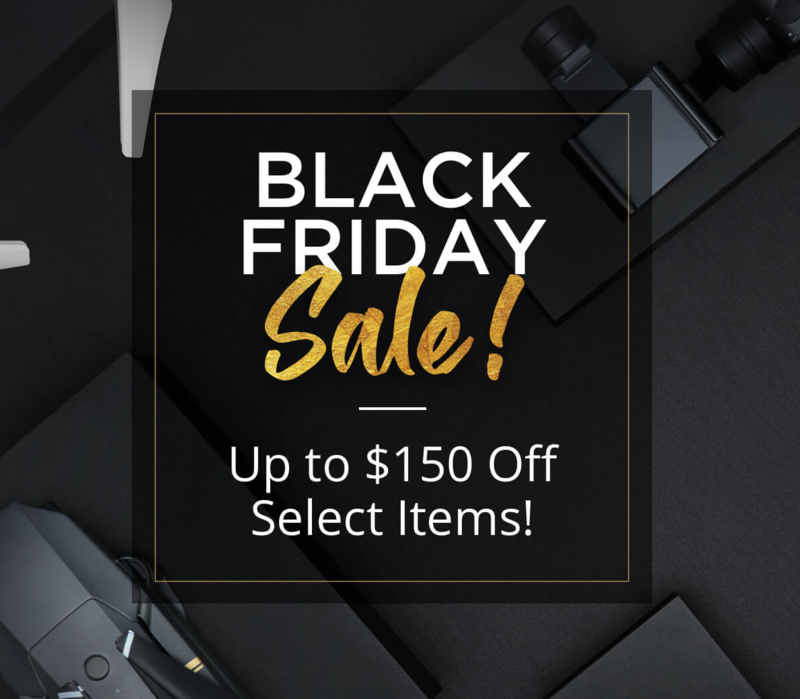 DJI Official Black Friday SALE has started. I am fairly certain the links are worldwide! 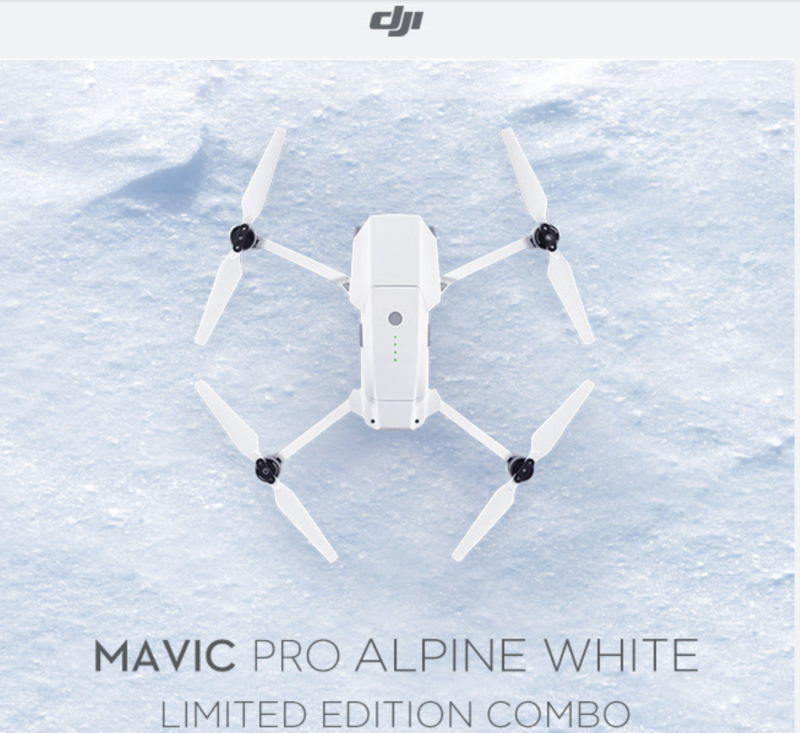 DJI is having a special on a new model of the Mavic Pro – which comes in Alpine White. The Kit comes with 3 total batteries and a few other extras and is only $1049 ($50 above the regular retail price). 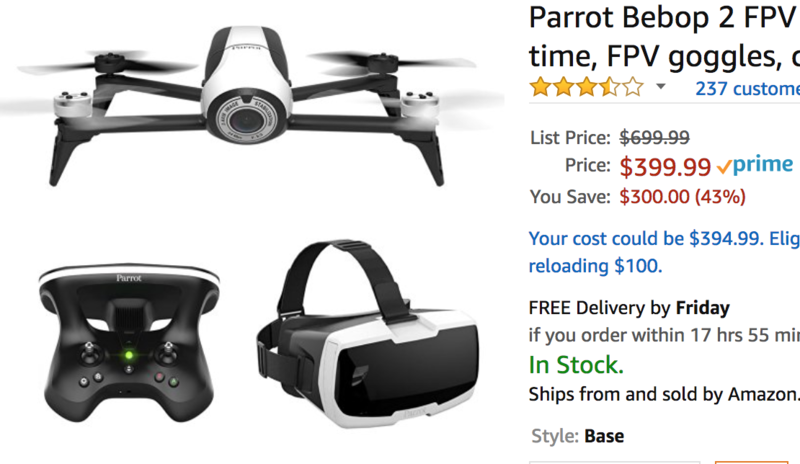 Bebop Parrot $405 with FPV, controller, etc. This is the lowest price we remember – they were $649 at first, then down to $499. 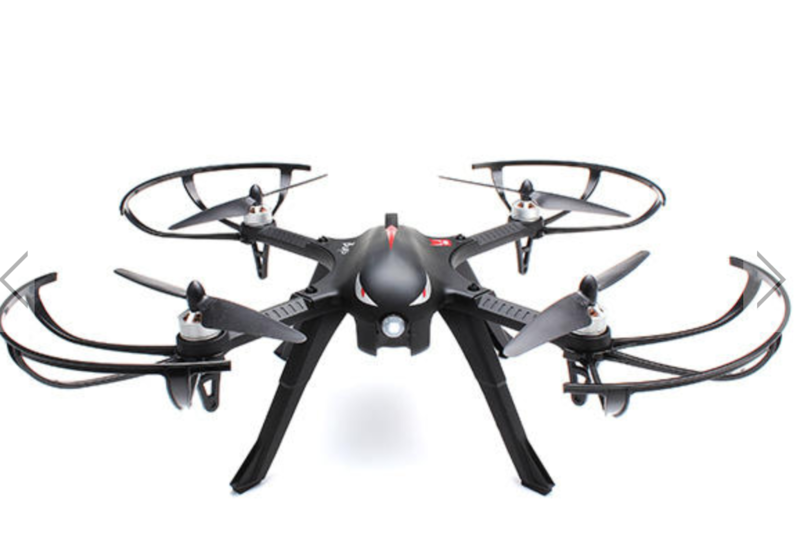 This is an updated model of the Hubsan which started it all back in 2013 – one of the first popular consumer drones. Back then it sold for $45-$80, so you are doing well at $25 today. Various colors available. You can buy extra batteries, prop guards, etc. separately if desired.